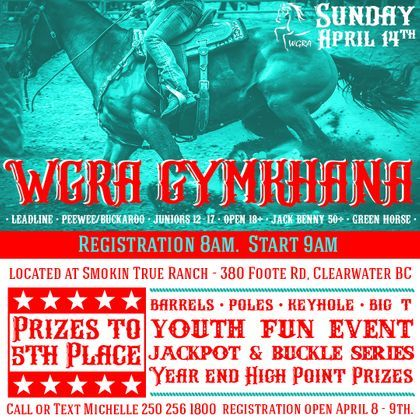 We are pleased to be able to host another year of Gymkhana fun for all WGRA members! Below are details of the 2019 dates, details, rules and regulations. *Designed for an inexperienced horse in gymkhana events in first two years of showing with an experienced rider. ~ ALL riders must clean up the manure of their horses before leaving the premises or a $20.00 fee will be charged before entering the next scheduled event. ~ Always be conscious of other horses and/or people around you at all times, keep your hors at a safe distance from other horse and/or spectators. ~ Mistreating or abuse of animals will not be tolerated, this includes excessive spurring and/or whipping. ~ We reserve the right to refuse entry to lame horses. ~ No tying horses to fences or trees. Tie to hitching rails or your trailer only. ~ A horse known to kick must wear a red ribbon in its tail and be kept away from other horses and spectators. ~ ALL entries to be PAID IN FULL with the event coordinators before entering arena. NO EXCEPTIONS. ~ Gymkhana committee has the right to refuse entry without refund if rules are violated. ~ Order of ride is random draw only. ~ ALL riders must ride in order of schedule, however, special consideration may be given to those who must leave early at the discretion of the committee. You must inform the committee at time of registration. ~ If horse or rider get injured and cannot finish out the day, rider will not lose points for year end. ~ Contestants should be ready on deck and at the gate when your name is called to enter arena, riders will be called 3 times and then we will move on to the next entry. ~ Arena time limits will be in effect. Riders will be given a maximum of 2 mins in the arena, if they have not completed the course, they will be asked to leave the arena in order to carry on in a timely manner. ~ If you knock over a pole in stakes you will be disqualified. ~ If you knock over a pole or barrel in Big T race it will result in a 5 second penalty but if more then 1 is knocked over, then rider will be disqualified. ~ If you knock over a jump in scurry race, knocking over a pole as well, it will result in you being disqualified. ~ If you step on or over the line in keyhole you will be disqualified. 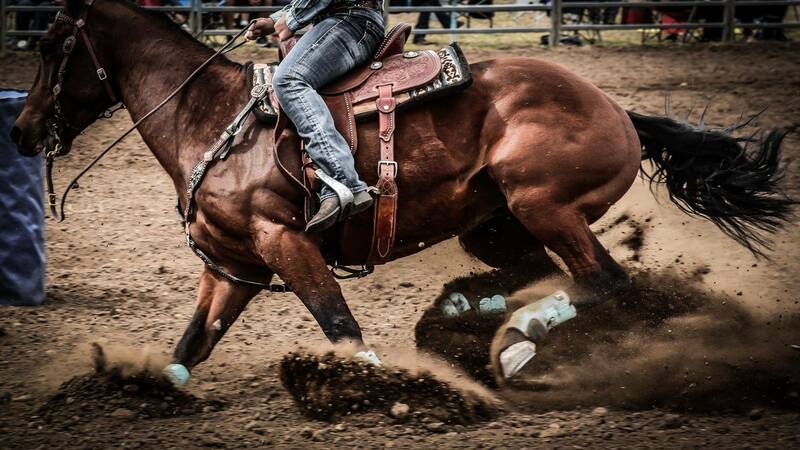 ~ Up righting a pole or barrel by hand while riding will NOT lead to a disqualification. ~ A handler may not cross the timer line with the exception on lead line class. ~ Horse and rider must compete in at least 4 out of 6 gymkhanas to qualify for year end high point and the best 4 out of 6 Gymkhanas will count towards year end points award. ~ Exceptions will be vetted out, horse is sold or the death of a horse. Written confirmation is required in order to keep your points. ~ Riders must ride the same horse through the day and throughout the year unless horse becomes lame and or is vetted out to qualify for points. Green Class- This class is open to inexperienced horses and inexperienced riders in these events with an experienced horse 2 years max in the division for same horse and rider combo. If the rider has comparable race times to the times in their age division the rider must move into that age division after competing in no more then 1 Gymkhana. The rider will be informed by Gymkhana committee of the decision to move them at the end of the day in which the decision was made. Points accumulated will be transferred over if the rider is asked to move to a different division. Once a horse/rider combo has won the year end high point in the GREEN CLASS they must move out of this division. A young rider may choose to move up and compete in the next division but may only ride in this division aside from green. ~ 2 people may ride the same horse in any age division, but 1 horse may not run more then 2 times in any division. ~ Manageable stallions may be rode but must be handled by an adult of at least 19 years of age. Note** The Gymkhana Committee has final decision in all matters related.